2 Where to sleep in Abyaneh? We left Isfahan after 4 days to enjoy some small areas before our last return to Tehran to pick up our visa for India. 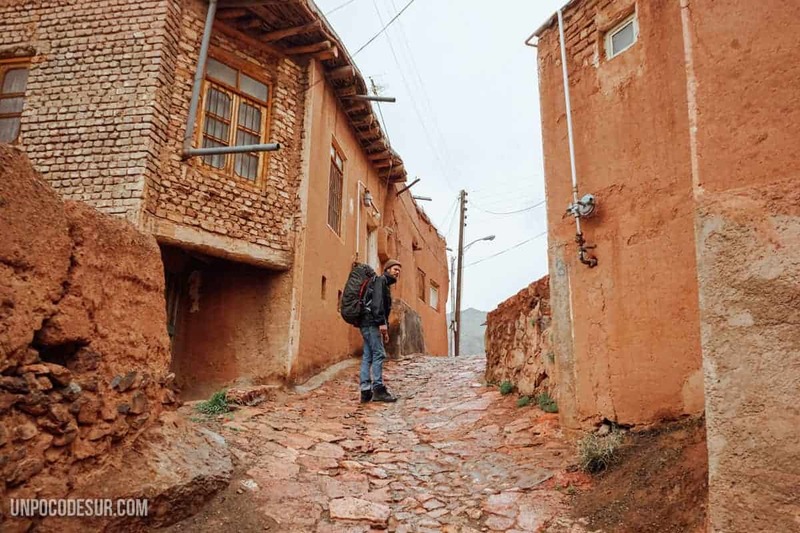 Our next destination would be the small red town of Abyaneh, located halfway between Kashan and Isfahan (plus a small detour), north of Karkas mount. 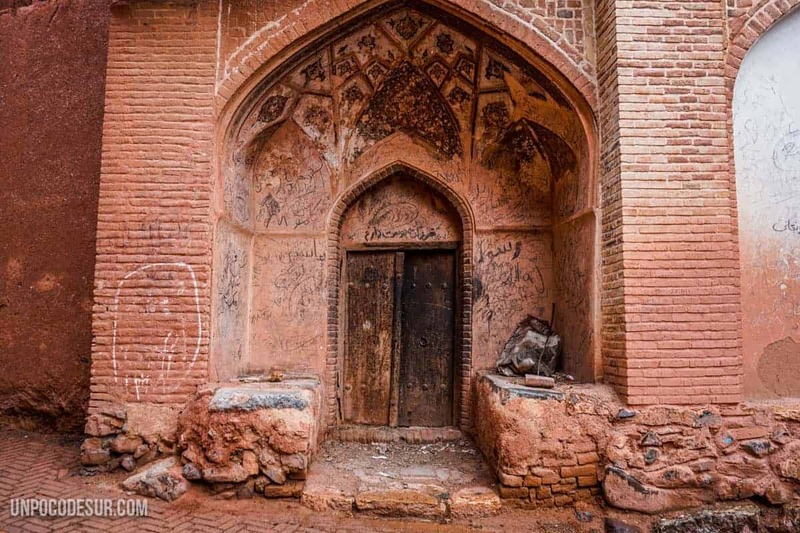 It is known for sure that Abyaneh exists for at least 2500 years, this makes its streets a perfect living museum where is possible to know a little more about the history of the country. In fact, the oldest building in the village, the Zoroastrian temple of fire, was built in the period from 500 to 330 B.C. Abyaneh has an inexplicable magic, probably due to its surroundings and the particularly red colour of the Adobe of its houses and mountains. Right in front of the village, it is possible to visit the ruins of the huge fort of Palahamoona, built more than 200 years ago and an ideal place to have a panoramic view of the village without being bothered. We reached Abyaneh hitchhiking since at that time we did not find any human way to do it with public transport (below we explain your options better). The first part of the road was easy, but the last part of the road was slightly more complicated as it is not a path of passage. The one who goes to Abyaneh can only go out the same way, so unless we found another tourist there wouldn’t be much more possibilities. When we were already losing hope a small car stopped and lowered the window. Murtaza, a car trader from the Iranian Balochistan area, passed through the area with a coworker and were on his way back to the capital. As soon as they asked us where we were and we told them the summarised story, they decided they would take us to the village completely deviating themselves from their route, something that, believe me, we tried to avoid. Murtaza said as an excuse that it would be a good way to see more than just the road and that he also wanted to stop, relax and eat something. He already made all the plans for us and we would stop in the only restaurant-hotel in town. We passed the Natanz plan, a town recognized in the area by the presence of its nuclear “base”. As soon as you get closer to the road it is possible to see the cannons pointing into the air. The signs that ask you not to take pictures of the area multiply and the landscape becomes bleak. 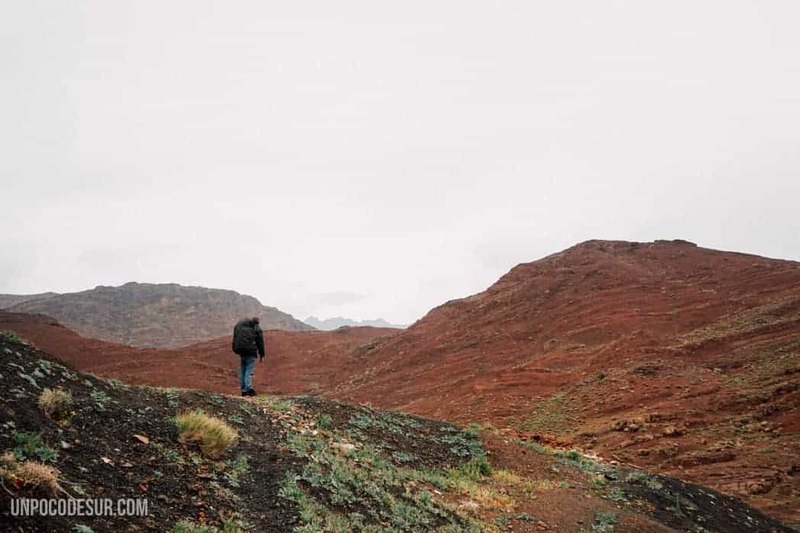 Shortly after Natanz, we turned to the left and took the last track to Abyaneh, in about half an hour we were at the “door”. Upon arriving at Abyaneh Murtaza and his colleague entered the restaurant and made us join them for lunch after several attempts to say goodbye eternally grateful. I’m not saying we didn’t enjoy your company, is just that we knew it would be impossible for them not to pay and we didn’t want to continue that path, but our attempts, as usual, were in vain. We enjoyed a delicious meal of two dishes like we didn’t in a long time, once we finished they said farewell, turned around and followed their initial course to Tehran. In a few minutes, the sky began to turn grey and we caught a pretty heavy storm, luckily we were in the parking area where a small mosque served us as a shed until the rain stopped. When we were safe we took the backpacks and went out to finally walk the town tiny streets. The rain was almost a gift, the floor shone wet and the water channels were down full, the water created an even more spectacular atmosphere. After several hours of going up and down its mazes, we decided to visit the fort and find a place to sleep. It turned out to be one of the wisest decisions, we pitched our tent at the foot of the fortress and enjoyed one of our best nights in the country with a panoramic view of Abyaneh under the stars. For those who are not willing to hitchike, you have three remaining options. The cheapest way after hitchhiking is to take a public bus to Natanz, for less than 80.000 rials you will have passage. You can take it both from Kashan and from Isfahan. 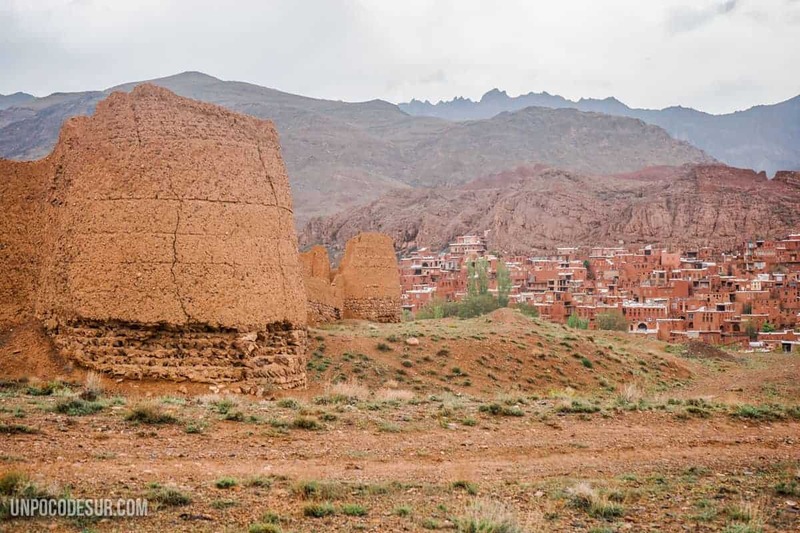 Once in Natanz, there is no other option than doing the rest of the journey on a taxi, the normal thing is that they charge another 80.000 to get to the village (by car). The majority of foreigners take a taxi directly from Kashan to get to the town, in this case you will be renting the taxi for the whole day as the idea is to wait for you while you explore the area and then take you back to the city. Taxi price is usually about 30€, to avoid any misunderstandings make sure to let the driver knows your intentions about more or less how long you think to stay in Abyaneh as we heard in many cases people complaining about their drivers pushing them to return in less than one hour. The other option is to hire a spot on a tour from any of the cities mentioned, about this we don’t have first-hand information but we met some tourists who did it. They told us the price per car is about 45-50 € leaving Kashan (which includes one of the gardens). It is important to keep in mind that once you approach the village you will have to pass a toll where you have to buy an entrance to access the town. At its time (2017) the entrance was 50.000 rials per person. With the entrance they give you a small pamphlet with additional information that comes very handy when you take a walk through the streets. 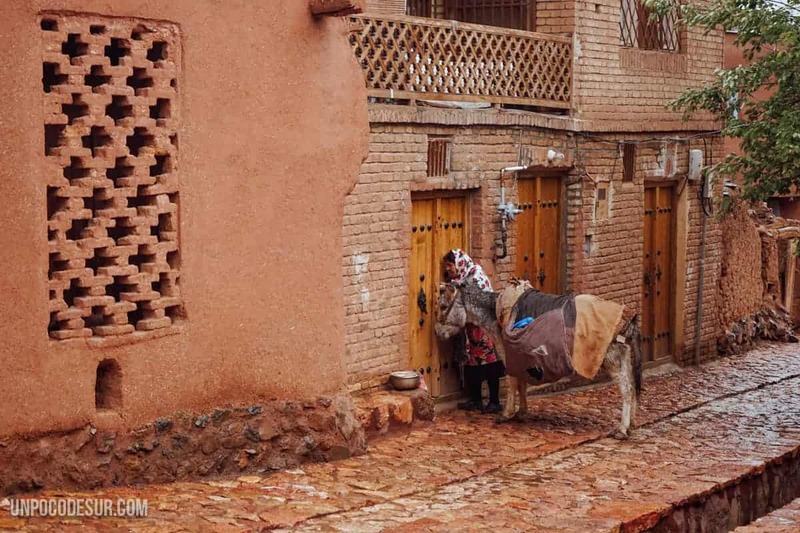 Most tourists visiting the town, both local and international, do it on a one day journey both from Kashan or from Isfahan (or even from Tehran). We didn’t want to rush so we decided to sleep at least one night in the area. In the fort, it is possible to camp without a problem and for those who want to sleep in a proper bed the village has a couple of hotels in the area. Sadly we are not aware of the prices. Have you been to Abyaneh? Did you like it? Let us know in the comments.